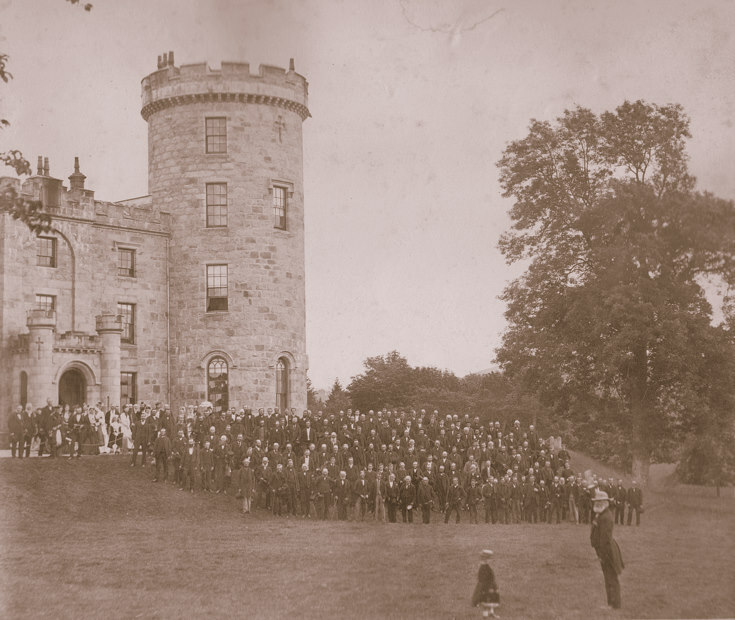 This photograph was taken on the 28th July 1869 on the lawn in front of Castle Forbes. The family and a piper can be seen standing on the left immediately in front of the doorway, and the many tenants of the Estate are to be seen to the right. Intriguing figures are those in the foreground....who was the little girl and who was the gentleman standing to attention (notice the array of military medals on his breast)? Malcolm Forbes thinks it possible that he was the factor. A note added to the photograph by Malcolm Forbes records that his ancestor, Horace Courtney succeeded to the title in 1868, so although little is known about this photograph, perhaps it was taken to record a celebration of the title succession? Photographer was A Martin, Alford.